We are thrilled to announce that a new release of Dime.Scheduler with a lot of exciting new features will be launched this month. If you are a Microsoft Dynamics NAV or CRM end-user or partner that is looking to integrate planning functionality into your business processes and vertical solutions, Dime.Scheduler is the tool of choice for you. Register here and be ready to get blown away! We hope you will enjoy the great new features in this new release and we are looking forward to receive your feedback. Need more information on how to become reseller? Contact us! We are pleased to announce that EQUE2 has selected Dime.Scheduler as a standard planning solution for their customer base. EQUE2 is located in Manchester – England and is focusing on construction and contracting, housebuilding and oilfield services. Eque2 says : We are pleased to partner with Dime and able to offer its planning and scheduling module for service managers and back office staff. With a growing number of our EVision customers requiring a more interactive service management visualisation showing where service calls are in relation to qualified engineers, we looked across the market for the best solution. Dime Scheduler provides us with exactly the view and functionality required. 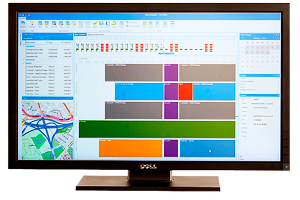 Built specifically for Microsoft Dynamics NAV, the interface is particularly flexible and allows multiple planning screens; multiple filtering and sorting of calls; sorting of onscreen data; graphical interactive mapping; and call prioritisation.